One-of-a-kind, mixed media utilizing varying combinations of printed imagery, resin techniques and reflective glass. 'Coral Reef' Splash Triptych; 60" x 30"
Feel the cool waters splashing over the coral reef, inspired by the Great Barrier Reef. 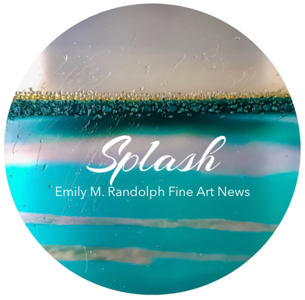 Mixed-media abstract on lustrous Dibond metal contrasted with reflective colored glass and Emily's glossy 'Resin Splash' technique.